The workers are really nice. They provide everything regarding drywall, really great company. The price and quality were the best. They were professional and fast with the job. They were true to their word and did what they said they would do. The work was high quality. They were complete and on schedule as planned. Essentially I had no issues. It was finished on time and extremely well done. Baltodano’s Drywall installs drywall for all types of new construction and remodeling projects in the East Bay, San Francisco, and Marin County. 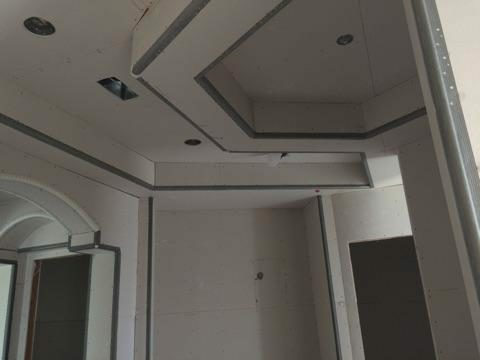 The company has the training and equipment to handle every phase of the drywall process, and it also has special expertise with hand-texturing—an old-world technique that allows its technicians to create custom patterns that add depth and uniqueness to walls. Baltodano’s Drywall has been installing drywall for all types of new construction and remodeling projects in the East Bay, San Francisco, and Marin County since 2012. 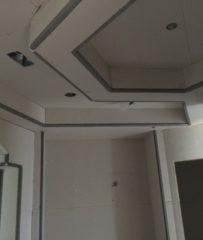 The company has the in-house capabilities to handle every phase of the drywall process, and its technicians also have special expertise with hand-texturing–an old-world technique that’s used to create custom patterns in walls. Consider quality when choosing drywall materials. Q: How long it will take to complete my project? A: It depends on the extent of the work, but once we put together a price estimate, we’ll be able to give you a timeline. Q: Can you give me an estimate on the spot? A: We usually need to take measurements first so we can go back to our office and put the estimate together. We prefer to spend time crunching the numbers to ensure accuracy, especially if it’s a large project. A: Yes, we offer free consultations so our customers have a chance to meet us and discuss their ideas for their projects. Q: Do you work with plaster? A: No, we strictly work with drywall. Q: What is hand texturing? A: Hand texturing is an old-world technique for adding texture to freshly applied drywall. Unlike sprayer-applied textures produced by machines, hand texturing enables craftsmen to create one-of-a-kind patterns. BRENTWOOD — From relocated electrical outlets to damage caused while moving furniture, there are many scenarios that require drywall repair. 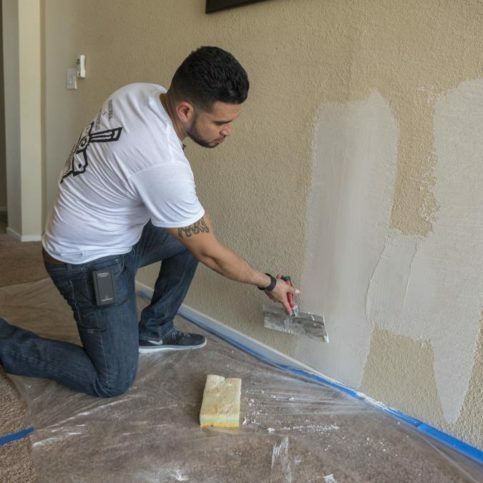 If you’re planning to patch an area of drywall in your home, you’ll need to make sure you’re using the correct procedure—otherwise, the results could be compromised. One common mistake is failing to give drywall mud proper reinforcement. For example, when filling in the gap between an electrical outlet and the adjacent sheetrock, novices often think they only need to apply some drywall mud. However, it’s also important to apply some fiberglass tape in between coats of mud. This will give the repaired area an added measure of stability. Another important step when repairing drywall is to blend the patched area with the rest of the wall. Simply take a wet sponge or rag and smooth out the edges of the patch. A lot of drywall companies neglect to do this final step, but it’s crucial to ensure a pleasing end result. BRENTWOOD — Host, Sarah Rutan: To fill in the wall gap around a newly installed electrical outlet, you’ll need to know the proper technique. Today we’re in Brentwood with Diamond Certified Expert Contributor Luis Baltodano of Baltodano’s Drywall to see this technique demonstrated firsthand. Diamond Certified Expert Contributor, Luis Baltodano: Hi, today I’m going to give you a tip on how to fix a gap between your outlet and your drywall or sheetrock. So, we’re going to use some hand mud. Put it in the gap right there. And using fiberglass tape, place it there, put some more mud, hand mud. And then here we go. This needs another two more coats, and you will have it fixed no time. Baltodano’s Drywall : Average 9.2 out of 10 based on 30 unique customer surveys of customer satisfaction. I liked the painting contractor. They were easy to work with and easy to talk to. I remodeled my kitchen. They were very professional, on time, and they cleaned up. They were on time and they cleaned up, basically all of the above. Good man, good people, and they are honest. They did a really good job. They are not exactly cheap, but they did a wonderful job, and it looks great. They took down my popcorn ceiling. They were able to squeeze my job in on short notice. The owner came out and met with us in person. He is really great with communication. They did what they said they would do and cleaned up after the job was finished. They are the entire package. Luis is a hustler and very ambitious. He delivers. It was very efficient, they did their work very nicely and neatly. Everything was put back. I was very happy. I liked the promptness and the way they returned phone calls. They checked in with me. I was very satisfied. I would tell them about this company. They are clean and professional. They answered all of my questions, and they tried to help me clear my things. They showed up on time when they were supposed to, and they had excellent service. I had an emergency, and they came out the very next day. I would recommend them. They kept a clean work space, and they were very professional. They kept a clean work space, they always answered my calls, and they were professional. They were one of the best contractors I used. If you need drywall done, give them a call. To call them for anything you need, I loved everything about their work. Their work was really well done, and I loved everything about it. I would definitely recommend them. He is a very good guy to work with, and he is competent. They were always on time, and the work quality was pretty good. He paid attention to detail. They were complete professionals, and they did a superb job at a reasonable price. They are a very good drywall company. They provide high quality work and they are very efficient, mainly the quality, no cutting corners with these guys.